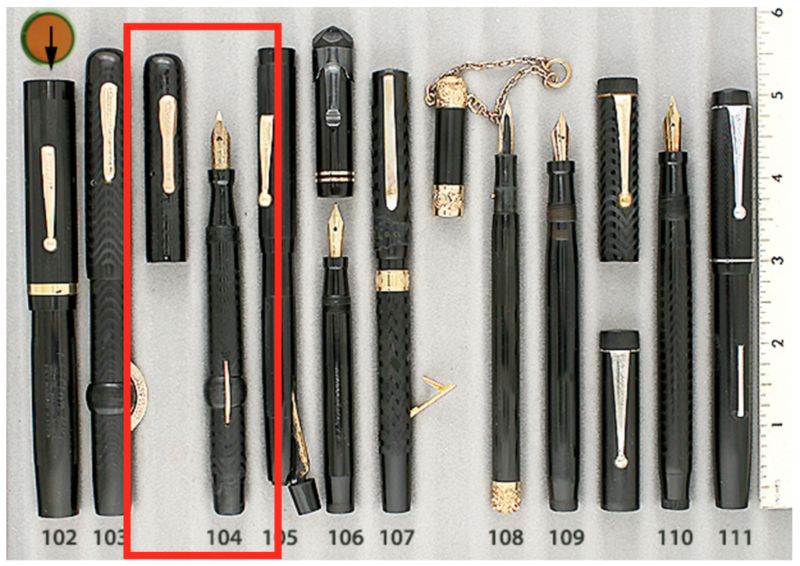 This Conklin from 1920 is a #20 Crescent-fill “Dummy” in Black Chased Hard Rubber. A mock pen, used for window displays, so a sellable pen would not get ruined by the heat, sunlight, etc. The pen is either painted black or heavily coated in clear sealant, so it would not discolor from the elements while on display. The cap can go onto the top or bottom. The nib is signed “14K Gold Plate.” The lock ring doesn’t turn. The very bottom of the pen is configured as a “V,” perhaps to lock the pen in place so it can’t turn and ruin the display. A wonderful piece of ephemera! Looks great in a display case, too! This entry was posted in Vintage Pens and tagged Catalog, Catalogs, Conklin. Bookmark the permalink. Follow any comments here with the RSS feed for this post. Post a comment or leave a trackback: Trackback URL.